Grits and Cream of Wheat are widely consumed breakfast items, and both are prepared in a similar fashion. Both are grains made soft through cooking, and their textures are nearly identical. Even the nutritional content of each is identical more often than not. Despite all of these similarities, however, there are fundamental difference that split the two; much like the Northern Cream of Wheat fans and Southern grits loyalists, advocates of each food debate which is better. 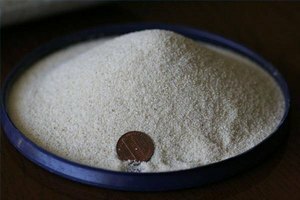 The official food of Georgia, grits have more than the state's approval to back up their distinctly Southern heritage. Made from ground and broken bits of hulled corn, grits were first used in traditional Native American cooking. In contemporary production, corn is dried until it is only 14 percent moisture, and every kernel is polished clean to remove debris such as cob, stalks and organic matter. Then they are ground by millstone and funneled over mesh screens allowing the crushed kernels to naturally shift into three separate products: corn meal, grits and bran. Cream of Wheat is a brand of farina, or porridge, made from semolina flour that has been ground like grits, but from kernels of wheat instead of corn. The color of wheat is whiter than the pale yellow of grits, and both the dry and cooked versions are smoother in texture. So associated with farina porridge, Cream of Wheat has become what is known as a "proprietary eponym," where the proper name of a brand is commonly thought to be the name of the actual food. 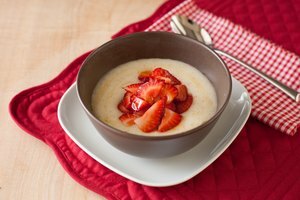 Grits and Cream of Wheat are both prepared by boiling water -- or in the case of Cream of Wheat, sometimes milk -- then pouring in the grains. Stirring helps to keep each dish free from lumps as it thickens while cooking. Once finished, each serving is dressed in traditional ways, again highlighting the differences between these food. Shrimp, bacon, andouille sausage or crayfish. Okra, fried corn, or tomato. White or brown sugar, molasses or maple syrup. Dried fruits, nuts, fresh berries. 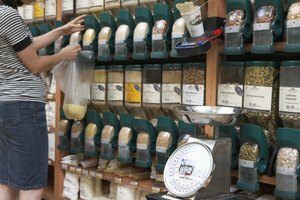 Spices such as cinnamon, vanilla, nutmeg and allspice. Whether your heart lies with grits or snuggles up to Cream of Wheat, both breakfast items pack in basic nutrition and a filling meal on the cheap.